The meaning of Vikas is ‘progress; a progressive and generous fellow indeed, is what I thought of him. Vikas’s father was a dhobi too and is now retired due to an illness since more than 6 months. One of their kind customers, Bishambar Khatri, has borne the medical expenses of his father’s surgery and medical care. Moreover, some other customers of his from Bandra contributed to the wedding of his youngest sister this year in May. Vikas got into this profession because being the only son he had to assist his father, and gradually picked up the necessary skills and techniques of the trade, even though he wishes he could have done something else, become someone else. Vikas is from UP, but he is born and brought up in Mumbai. He is educated till the 11th Standard, and had to drop out of school as he had to join his father in earning a livelihood for their family. His sister’s wedding was approaching and they had to work harder to earn and save for her wedding. He has four sisters, and all his sisters are married. His last sister was married this year in May, and once again some of his customers helped him with the expenses. Del told me, ‘….. I found out from my dhobi Vikas that you are helping him get a new bicycle, I too would love to be a part of this, can I too contribute to the cost of his new bike..?’ I happily agreed, even though Deb Mohan had wanted to buy it entirely for Vikas, I just could not refuse this lovely woman. Later, Vikas informed me that Mrs Del is often volunteering help to all kinds of needy people, and she volunteered to contribute for his bike when he had informed her about having met me randomly on the street and I had made him an offer he could not believe! God Bless Del; May her kindred spirit always remain as cheery as a melodic Church bell.  That reminds me, I studied at St. Theresa’s High School, Bandra west, and the melody of the church bell, our school had it’s own church, that sounded thrice a day remains imprinted deep in my sound-memories fondly. However, even if you do not have any such charming church bells memory, I am certain a bell does ring within each of us when we reach out to anyone. And even when we reach out to ourselves. I asked Vikas, – Which has been your happiest moment in life so far…? What even has made you the happiest? Long after he had left, I thought – Unfortunate are those who even after they spend millions cannot experience happiness. Here is one who found it within his home simply because he fulfilled what he must have thought is simply his duty towards his siblings. Bicycle Angels – Because it’s we privileged, and some unprivileged too, who can be there for others, those even-lesser/far-lesser privileged than us. This informal FB group (IT IS NOT A N.G.O.) provides ‘livelihood’ (Roadster) bicycles, (or even regular (mtb/hybrid/road bicycles), old and/or new, to those vendors or unprivileged people, who need a desi/roadster/ghodha bicycle to earn a livelihood, to use as a vendor of food FMCG commodities like coconuts, tea, newspapers, milk, idli, fruits, a knife sharpener, flowers, or if he or she is a plumber or electrician etc who uses one to carry his tool box etc, using the bicycle as a mode of transportation and for carrying/selling his/her goods; and sometimes to those less privileged people who need one for transportation to save on public transportation costs. Depending on how they come cross to me when I interview them, I make them contribute at least Rs 1000 to a minimum of Rs 500 for the donated bike. Of course, if I feel they are very poor and deserving then they need not donate anything in exchange of a new bike. Sometimes I offer to pay half the cost of a new bike, and offer then Rs 500 for their old bike. And I take their old bike from them and donate that to some needy person, and sometimes make the receiver pay a donation of Rs 100 to 500 for the bike. Then this donated amount I receive from the recipient of the old bike I add to our kitty to buy a new bike. We also provide Wheelchairs for those physically or mentally challenged. November 14, 2013 and Jan 7, 2014. I MUST mention here, so far, none of my acquaintances or friends who donated money for a bike have asked me for Purchase Invoices of the new bikes I have purchased on their behalf so far; however, whether they want the Invoice or not, whether they like it or not, they will receive a scan or photographed copy via email or their FB inbox or via whtsapp etc! Period! No discussions/arguments on this; The clearest glass, the clearest Diamonds, are always crystal clear, and hence desired and beautiful. Further, donors can ask me for the phone number of the recipient they donated a bike to, that’s if that recipient has a phone number or even permanent address, as some of them just too poor and don’t even have an ID! In addition, I cannot guarantee how the recipients will put the donated bike to use, I just don’t have the infrastructure nor time to follow up on them post them receiving the donated bike, I just somehow have to go by my first instinct and faith in their need. Please do ask for their phone numbers or address if you wana speak or meet them for whatever reason, and if I can provide you the same, I shall most happily. If you are Mumbai based, it would be nice to have you present when the bike is paid for to the cycle shop, or when the bike is handed over the recipient. You welcome to be present, as it will make your donation more personal for the recipient, I think. I also send the audio file of my conversation with the recipients to the donors of their bicycle only, I began doing this after I was interviewed by Dubai One Tv in Febuary 2014; I realized the importance of having a proof of my conversations with the recipients. Today I was truly humbled! On my ride on carter road this evening, I stopped to talk to a stranger, (Susheel, he later told me his name was), he must be about 22/25, selling tea coffee. I asked him if he would like to own a used bike (bhaiyya/ghoda/desi bike) to carry the tea coffee he sells to people on carter road. I told Susheel, my pals will pay for the cycle if he can show me the old bike he needs to buy for his trade purpose. Susheel suddenly stooped down to touch my feet! For rs 600!! !, which was not even my money, but a collection from my caring friends! Because I had told him some pals gave it to me to do some good on their behalf. Such a great value it has, that a proud man, as he chose not to beg but walk selling tea coffee, is willing to touch another man’s feet in gratitude!!! I turned my head least he see a man twice his age cry. In retrospect, I think maybe this was when I realized that we rather donate a bicycle (a roadster) to a person who needs one for his/her livelihood, or to better it, or to use it as a vehicle of transportation for himself/herself, then donate a bicycle to a child who needs one to travel to school, because the adult can feed his entire family with the help of such a bicycle. So that’s how it all started, I think, when I had first decided to buy a new bike for a school going underprivileged child. @ Beautiful Bicycles Beautiful People. I realize now it gets quite tiring expressing the same thoughts (replies) again and again. So I decided to prepare a kind of standard response I would normally give my pals when asked this legitimate question. An old used bike in good (I mean, donate-able-condition, because even the poor deserve a dignified gift) costs anything between 1500 to 2200. But its very hard finding old bikes on sale and no one selling one offers a bill or receipt for what you pay for them. Further many old bikes on sale are stolen ones, or desperate sale, because why would a man riding one for a livelihood sell his mode of transportation, or if they upgrading to a new bike, which is so rare. Also, buying a new one comes with a purchase receipt, gives legitimacy to the purchase and thus initiative too. Anyone who donates money for one, ideally should receive an authentic bill of money paid. And a brand new Hercules that can carry very large quantity of weight costs between 4200 to 4700, depending on the nature of goods carried by the vendor. The advantage of buying a new bike for donation is, when we donate a new bike to a vendor who gives us in exchange his old used fairly-good-condition bike, we further donate his old bike to another vendor who does not have a bike and needs one. So the expense of buying a new bike (anything between 4200 to 4700) gets divided into two donations – one being the new bike, and the other being the old used bike we receive in exchange of donating the new one. However, you do not have to donate the entire amount required to buy a new bike; say, even if you donate Rs 100, we will simply add it to the kitty, add it to what others have and will donate in future, and when it amounts to Rs 4200 pr 4700, we will buy a new bike, and credit the donation of that to all those people who contributed in helping us reach the figure of 4200 to 4700, even if that takes us a month or more to achieve. Though I am always asked this question, I never ask any donor to contribute any specific amount, as that would defeat the very purpose of charity, kill the essence of donation. It is up to you, a donor, to offer any quantity of your kindness, and its my duty to graciously accept it with the same respect I would accord to someone donating the entire amount required to buy a new bike. Hmmmmm, one thought I did have once was, if you go around your immediate circle of family and friends, and collect 4200 to 4700, the cost of one new bike, this new bike and the old one that will subsequently come with it in exchange from the recipient of the new one, both will be donated and credited to your entire group of donors (friends or family) you gathered/pooled the donation from. So it becomes like a personal donation from one set of friends or family, and I think that would feel so cool that a close group of friends or family become associated with two complete donations, responsible to help two sets of families earn their livelihood much better. But I understand it will be a real headache to gather support in something you alone may believe. I leave you with these thoughts, random ponderings of mine, to help you make your decision. Whatever it be, it will be embraced. Most importantly, if you Bombay based, please try to be present when the new or old bike is purchased from a cycle shop in Bandra west, (of course provided they offer us a discount; and their bill I send to the donor via mms or via an email) or when the bike is donated. That would add much value to your kindness. On TV: Peeta Planet Social Travel Series’ (Dubai One Tv) ; Mumbai Episode of Bicycle Angels: telecast from Dubai in May 2014. A tribute for Bicycle Angels and it’s donors in the Mumbai Mirror, in May 2014. A tribute for Bicycle Angels and it’s donors in the SUNDAY BUSINESS STANDARD. July 27th 2014. Just wanted to tell you how much i was touched by your little video on youtube about the most beautiful bicycles. I was expecting hi-funda cycles made of carbon fibre, foldable, etc, but what you showed was simply awesome. I’ve always dreamt of buying a Brompton one day, but today i’ve realized that it means nothing. Thank you for helping me realize it. 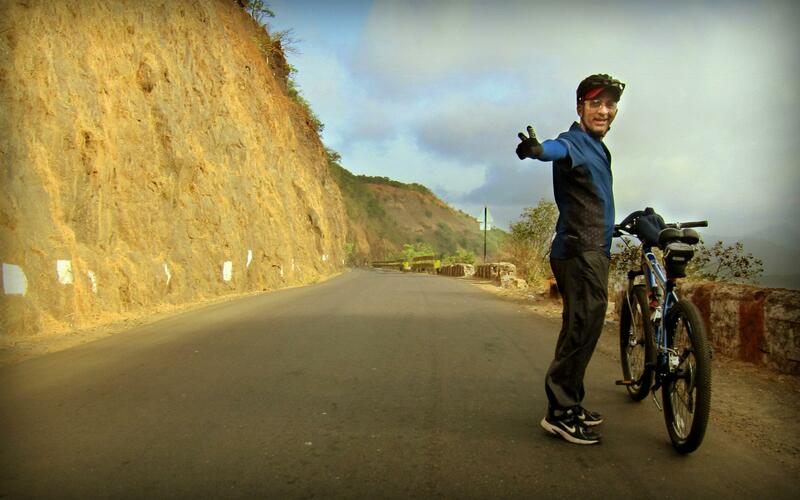 Two years ago during a round of outdoor cycling in Bandra, Rakesh Bakshi had an experience that left him feeling small. The filmmaker had stopped for a chat with a local tea seller, Susheel, in the course of which he offered him Rs 800 to replace his battered bicycle. When the boy acknowledged this by touching his feet, Bakshi’s own expensive lycra gear, helmet and eyewear suddenly seemed too gaudy. “It was a sum I might have spent on a terrible weekend movie ticket and popcorn without thinking twice. That really put things in perspective,” says Bakshi. There is a sense of discomfort in charity that the privileged can feel, says Bakshi, but that has not stopped him from making a habit of it lately. 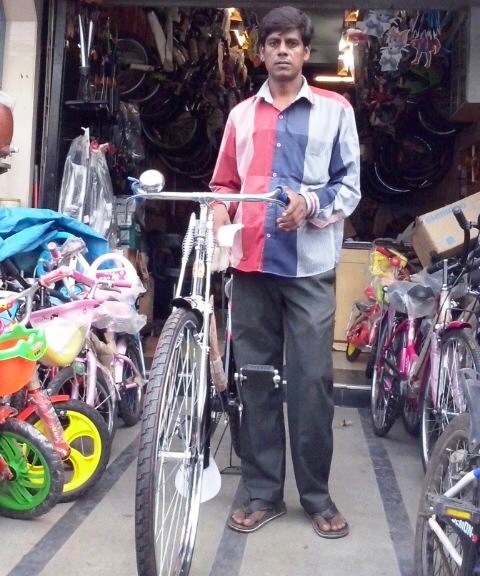 His social initiative, Bicycle Angels, has donated as many as 73 cycles to people whose livelihood depends on them. And 4 wheelchairs to CP children. It is not an NGO and perhaps comes closest to the idea of crowdfunding, except that the crowd mainly comprises Bakshi’s friends and family, and few are strangers. They chip in with amounts starting from Rs 100 to Rs 10,000. When the donations total Rs 3,000 to 4500, Bakshi buys a new cycle and gifts not more than one or two every week since September 2013. He also writes about his experiences with these recipients, and about the recipients’ lives. A Google-sourced photograph, which is the header image of the Bicycle Angels blog, sums up the founder’s biggest takeaway from the initiative. 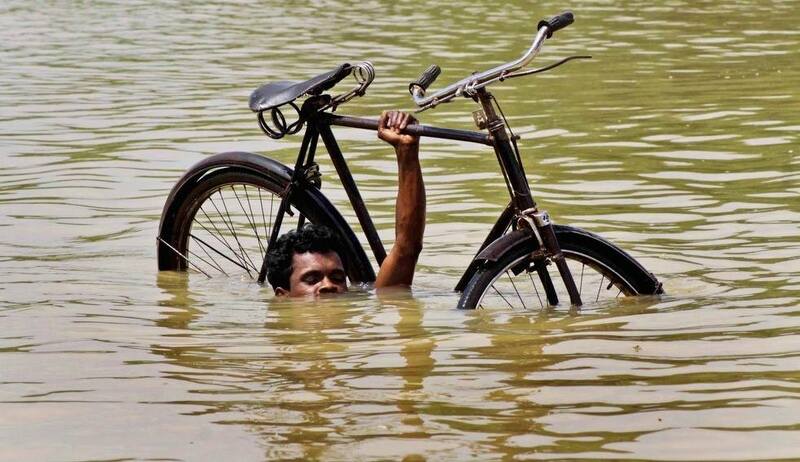 In it, seen wading through neck-deep floodwaters is a man with eyes transfixed ahead with one arm raised bolt upright, clutching a bicycle purposefully. The humble mode of transport is “nothing less than a Ferrari” for these daily wages working class heroes, observes Bakshi, who lately was the Hindi dialogue writer for the Walt Disney film, The Million Dollar Arm. Now in his cycling sessions, he looks for workers with worn-out cycles and others who do not own one at all. He learnt how the vehicle’s wear-and-tear can affect fortunes from the way daily labourers describe a cycle’s age, in terms of how many rainy seasons it has survived – for instance ‘char baarish’ (four monsoons). Bakshi, who is the son of renowned lyricists Anand Bakshi, now has heightened respect for no-frills Roadster cycles that can carry loads of everything from coconuts to plastic pots. Bicycle Angels had its beginnings when Bakshi started cycling in the mornings from Bandra to South Mumbai. He heard about a social initiative Campus Bicycle Project started by a few St. Xavier’s students, where they collected and refurbished unused childrens cycles for gifting to poor school children in nearby villages. Bakshi decided to sponsor one for them and asked his friends, 33 of them, to contribute Rs 100 each. Soon, he had received MONEY enough for three cycles, and thus began looking for others, like the humble tea seller Susheel, whom he could help. He has been learning on the job. Many people he approached were too proud to accept help and many wanted him to help others more needy than them. When several others too declined the offer to exchange their old bicycle with a new one, Bakshi changed his strategy. “I stopped using the word ‘daan’ (charity). Instead, as many are too proud to receive charity, and began telling the potential recipients they would be donors too if they agreed to receive a new bicycle in exchange of their old one since their old bicycle would help someone without one. 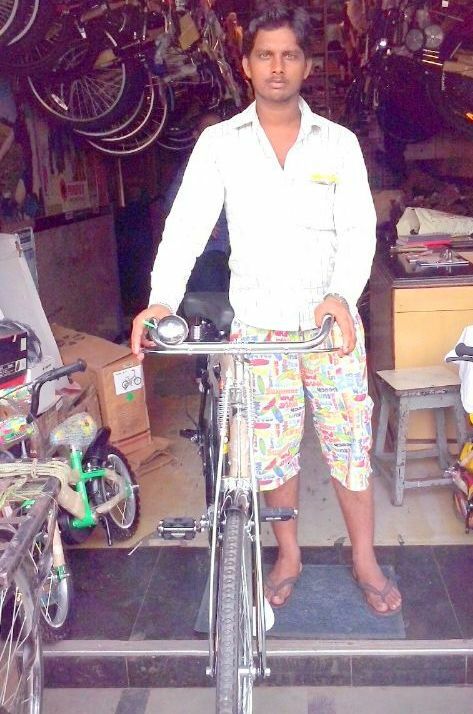 He gives away their old bicycles to daily wages workers who cannot afford to buy a bicycle to better their livelihood.” Sometimes the recipients of new bicycles contribute Rs 500 to 1200 towards the purchase too, they chip in too willingly. And at most times, the recipients of the old bicycle themselves offer to pay, donate, Rs 100-500 for receiving the old cycles from Bakshi. Bakshi adds these donated sums received to the donor’s pool and later when it amounts to the cost of a new bicycle then he buys one new one for donation. Invoices of the purchase made are always sent to the donor of the bike, and the recipient too, for total transparency; even though most donors being his friends and few even strangers, have never asked him for the Purchase Invoice of the bicycle they want him to donate on their behalf. A few beneficiaries, of old and new bicycles however, have reported their Roadsters missing (stolen). As depicted in Vittorio De Sica’s classic Italian film The Bicycle Thief, the empowerment a cycle can bring makes it a commonly stolen item. The initiative has supported some offbeat professionals too, including a seller of nazar battu (an evil-warder) charm made out of lemons and chillis and charcoal, and someone who prepares and delivers lunchboxes to security guards. The Bandra resident is not ambitious to make any ambitious plans for his private social-project. Keeping it simple will help transparency, he reckons, it’s the clearest diamond that will sparkle best. Daily wage workers almost always cycle carefully on the left side of the road, more out of a need to safeguard the vehicle than anything else. He feels it’s because these daily wages riders do not have insurance. However, often when traffic on roads are cleared to wave through ministers or VIPs, Bakshi says he sees security guards gruffly shooing us away and even these bicycle riding labourers. “However, In my opinion, these humble daily wages riders, workers, are more worthy of being inside those cars,” he says. Messiah has CP (Cerebral Palsy), he cannot walk,  , and cannot hold his head in one place,  ; so the back of his wheelchair will need additional support to help maintain his head upright. He studies at ADAPT, Bandra west. He is studying in ‘Transition class’, equivalent to senior KG. Messiah lives in Bandra, his father is a motor vehicle driver. He has two brothers and one sister. He likes to accompany his family on all outings, like family weddings or social gatherings. I asked her if her son can speak clearly? I asked his mother, why she named him Messiah. I had mentioned this in an earlier post, that I met some mothers who have named their CP children after their Gods; I think, maybe they do that with the intention that their God’s benevolence grace their very special child. This will be Messiah’s very first wheelchair. I do not know his medical condition completely, as I am not his doctor, however, I hope this will be his last, and someday we pray he will walk. Another thing, we made certain we buy him a very good quality WC, so that it lasts for more than a decade, if need me. No compromise on the quality. Another good thing, Messiah’s WC was purchased from a centre in Worli where physically challenged people make especially-adapted-for-the-straight-head-position WC’s; so in a way, you donors are encouraging their livelihood too by buying this especially-adapted WC from this centre. It’s called, The Fellowship of the Physically Handicapped, @ Haji Ali. Do note, his mother did not use the word ‘ONLY’; she did not refer to her son’s capacity to focus and see being ‘only’ 60 percent. When the principal of ADAPT had told me about Cecilia, she had said, ‘…the boy’s mother is a very determined and positive women.’ A determined and positive MOTHER, truly. Cecilia replied, “Messiah likes to go outside…. some person gifted him a pair of shoes, so he tells me in actions and a few words – Mumma, make me wear these shoes… take me outside the house… He likes to look at the cars and people passing by…” Cecilia cried then. Later, when I was on my way to work, I thought – We fortunate peeps can go out and experience the warmth of sunlight, bathe in the soft shadows of moonlight, dance in pearls of raindrops, look at the brilliance of stars, smell all fragrances of the outdoors, savor all other benevolence of Nature and God, whenever we want, in a blink of our eyelid. In fact, even before our eyelids shut in that very blink we peeps can be outdoors on our own accord. Thank you God, thank you Mother Nature, for your benevolence on us. I now believe, Jamsethji may have said that because he would rather offer the favors and privileges he had earned for himself from his hard work and intelligence, to the more deserving underprivileged and unprivileged. Thank you to Pavitra and Surabhi for their benevolence, donating this WC to Messiah; (I think either Cecilia, or ADAPT, one of them contributed some amount towards this purchase.) And just like his mother once wished while naming him, we too wish that the benevolence of Jesus nest and rest in Messiah and only grow. Amit is from Bihar. He has two sisters and two brothers. His two sisters are married, and he and his brothers financed their weddings. Because his father lost his mental stability when Amit was in the 10th standard, and being the eldest son he had to stop studying and begin earning a livelihood. Ever since then, he has worked every day of his life. His father is still mentally incapable to work, and he continues to send money home to his parents regularly; so do his two brothers. All 3 sons continue to support their nearly mentally invalid father. Amit arrived in Mumbai around ten years ago to work at his close relatives house in his uncle’s cloth color-dyeing business. He worked there for five years until it shut down. His uncle still owes him a large portion of his salary of five years which he has not paid him. While he was working with his uncle, his uncle had advised him “Do not take your complete salary from me. Take just enough for yourself and your family back in the village. The rest I will give it to you whenever you ask for it.’ Amit trusted him. When his uncle shut down his dyeing business doe to losses, he refused to pay him his five years of savings. The lesson Amit learnt from this incident, and some other similar incident, – Never trust family or strangers 100 percent. Always safeguard your interests, whatever he your relationship with the person you dealing with! No one is worthy of your 100 percent trust!! Amit sells his goods at the street corner at Nalasopara/Virar; the biggest problem he faces is not from the Police or BMC, but from the local goondas and taporis, as they never pay for the stuff they consume. And he dare not ask them for money, as he fears for his business and life if he antagonizes them in any manner. Amit needed a bicycle to take his daughter to school daily. He takes her to school and brings her back home too. He can do that because his working hours are from early evening to late midnight. His goods sell mostly only in the evenings. He had an old bicycle he used for this purpose, but a month ago it was stolen, so he now walks his daughter to school which is about one kilometer away. The bike was also of great use to him to cart portable water home every morning, from a site that is around 2 Kms from his house. He lives at Nalasopara. Though Amit does not need a bike for earning his livelihood, I felt he is worthy of receiving the old bike that we got in exchange from the previous recipient of a new bike (that was donated by K and Surabhi Shah.) Amit willingly agreed to contribute a donation of Rs 500 for receiving this old bike. We will add this amount of Rs 500 he will soon pay to our kitty to buy a new one someday for someone worthy. I asked Amit which has been is happiest moment of his life so far? When has he felt the happiest ever? Ancient India has a wide range of traditions and old wives tales that are carried generation to generation. There are fast track remedies for all ailments, like how to banish fear, fear of death, common colds, coughs in children, evil eye and frighten evil spirits. People also put them on their vehicles. At the entrance to houses it is dangled outside the main door, likewise in business establishments; sometimes it is changed daily, weekly or fortnightly. Once removed from its position, it is thrown on the open roads far away from the house or establishment. Care is taken by passerby’s that the ‘Nazar Battu‘ or Nimbu-Mirchi totka is not stepped on while walking or driving or riding, for it is believed that the one who steps on it will invite all the bad influences that the Nazar Battu had gathered while it hung in its place. It is hung outside the door to keep away Goddess Alakshmi, or Jyestha, who is considered inauspicious. Alakshmi is the sister of Goddess Lakshmi, the Hindu goddess of fortune and prosperity. Alakshmi brings poverty and misery. Alakshmi likes sour, pungent and hot things. Therefore shopkeepers, merchants and people tie lemons and green chillies on the doorways of their shops and homes so that Alakshmi will only come up to the door and eat her favorite food and satisfy her hunger and leave without entering the shop or house. It is believed that after consuming lemon and green chillies, Alakshmi loses her urge to enter the house or shop. She will turn around without casting her malevolent eye on your well being. However, it continues to persist in some sections of our society, both very rich and poor. However, thank God for some myths, as most of them are a source of livelihood for some people. 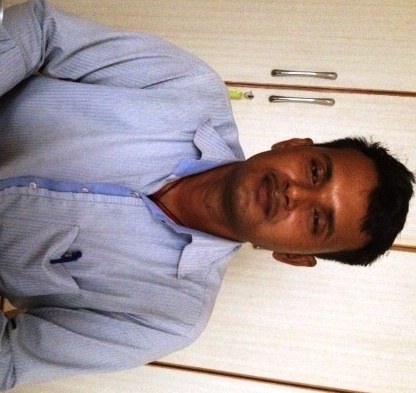 Shankar is originally from Solapur, but born and brought up in Mumbai. Earlier they lived at Bandra reclamation, but 20 years ago their hut was demolished and he had to drop out of school too, because they got displaced overnight. This was another moment when he cried. Earlier when he told me of his child dying, he cried then too. The other jobs he does on and off is any kind of daily wages work that comes his way 6 days a week. Because one day a week he spends from 3 am to 4 pm delivering Nazar Battus in Bandra west. Ever since roads got concretized and paver-block-ed, the daily wages work he would get has stopped completely. Because he was a skilled labor in laying tar roads. Modernization of our streets stole a big part of his daily wages livelihood. He is still looking for any kind of daily wages work. How did I meet Shankar? This morning, I past him while riding to South Mumbai. He was riding a very old bicycle, and seeing its condition I just had to stop and ask him if he needed help in buying a new bicycle. When I learnt about his life, (some of it is too private to share here), I very badly wanted to help him get a new bicycle in exchange of his very old one. He has been doing this work since 12 years, and the bike he was riding is the very bike he started this profession with, 12 years ago. The pitfalls in his profession, when the rates of veggies shoot up, lemons and green chillies are not left far behind and most often he has to bear the extra costs due to food inflation. Because most of his middle class and poor clients refuse to pay him any extra amount then. But most of his rich clients willingly pay the extra amount when rates of these commodities go up. He has a family of three bothers and one sister. His sister is married, and both his brothers also sell these Nazar Battus in some other locations of Mumbai. He was keen I help his brothers too, help them get new bicycles; I did not promise him any such help, but I told him to contact me after a month. The money he earns delivering Nazar Battus to people, and from any other odd jobs that he rarely manages to find nowadays, he hands all of it to his wife; she keeps aside some money for their house expenses, and some she uses to pay the monthly installment of their debt that has been accumulating since years. He says, gradually he is able to pay off his debt, however little by little, every month. Bravo Nazar Battu Shankar! Cheers! 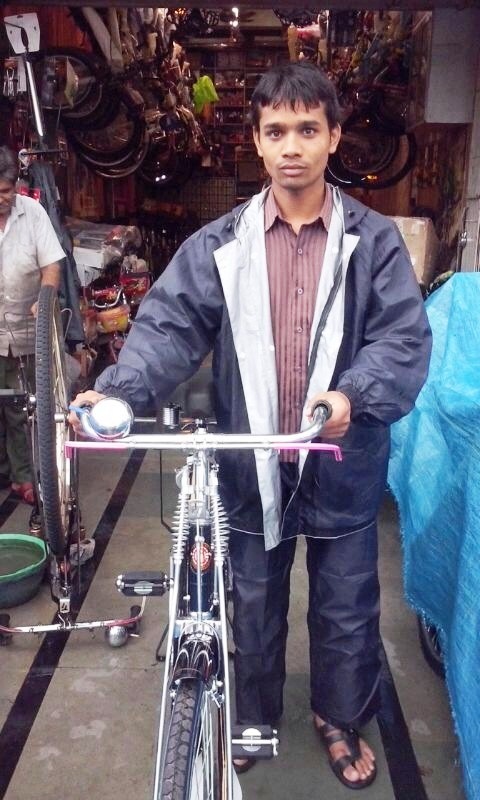 Thank you to K and Surabhi Shah for buying a new bicycle for Nazar-Battu-Shankar; that’s what some customers call him! His old bicycle we will donate to some needy person. Thank you to Gazi Ali for the photo of Shankar. Mahandra Pratap Sahu (25) – Fruit delivery. I enquired about the efforts he has made so far for a mainstream job post his education. He informed me, while he was in his village, two years ago, he applied for a job in just a couple of places, but being unsuccessful he soon travelled to Mumbai and took up the job of delivering ordered fruits door to door. Currently he is employed with a man who owns a fruit handcart in Bandra, and he earns a monthly salary of Rs 5000. He remits a large portion of it home to his family in UP. Mahandra arrived in Mumbai around a year ago and found a job delivering fruits with a relative who owns a handcart. I realized he has put in a just a handful of applications for a job. I told him he has certainly not tried hard enough for a better job, in keeping with his education level, and I hope he will continue to send more applications for a job. Honestly, I think he gave up too early, he stopped trying for a job too early. Back in the village, he has two brothers, one runs a mobile repair shop, and the other is still studying. The family has some agriculture land and they grow grains and vegetables. However, the income from agriculture is not enough to sustain their family, so he came to Mumbai. His best customer is someone at band Stand, they never bargain and also give him a tip for every delivery. His boss has told him, ‘Since the money you collect from customers is with you until you hand it to me, if en route you are hungry you can spend some of it and eat, do not hesitate to spend some of it on food.’ Customers do not buy Bananas that have a broken top, so that is the ones he eats when he is hungry, and they also offer it to the poor they come across on streets. That, is their bit of charity, I guess. His happiest times are once a year, when he travels to his village for a month or two. That is the same time all his close relatives from wherever they live in India, they head for their village. They all gather to live together as one big joint family then. He works along with his family on their agriculture land in that period. His grandfather is the one he was the closest to. It is he (his grandfather) who educated him, paid for his education and that of his siblings. He expired three years ago and he (Mahandra) misses him a lot. He feels, if his grandfather were alive now he would have not been working as a fruit delivery boy. Because, he was a resourceful and influential person, and he would have been able to get Mahandra a mainstream job post his graduation. The best lesson his grandfather gave him was never to fight with anyone, never ask anyone for money, for a loan, even if it for education. Mahandra has done a course in welding too, and that is another profession he can follow if need be. He did get an offer of a job as a welder at a monthly salary of Rs 12, 000 but because he did not have any welding experience he could not get the job. I asked him if he still has hope alive within for a mainstream job? He replied, ‘I do. I am hoping that someday some big Seth whom I deliver fruits to, if he happens to belong to my community may offer me a job in his office or business. True. We must have self-pride in any honest work we undertake for a living. Dignity and pride in your work, is in your hands, not in that of others. Reminds me of : “Dignity consists not in possessing honors, but in the consciousness that we deserve them.” – Aristotle. Thank you to Vinay Datt for donating this new bicycle to Mahandra. Mahandra shared half the cost of the bicycle, because I asked him to and he was most willing. And thank you to Kohinoor Cycles (http://kohinoorcyclestores.blogspot.com/) Siddharth Vora (https://www.facebook.com/siddharth.vora.58?fref=ts) for the good discount and service. Thank you to Gazi Ali for the photo. He has one brother and two sisters, all are educated. His bother has passed his CA (Chartered Accountant) exams and is seeking a job. His mother was very worried about her elder son and hoped he finds a job soon as an accountant etc. His father suffers from diabetes, and has also suffered a heart attack, was once working in the Gulf, but is currently unemployed since three years. His mother is a homemaker and along with her brother, and her family, she looks after Yasin’s needs. Yasin’s sister gives tuitions to children and supplements the family income kitty. I learnt, from his mother on asking her, that Yasin means ‘The core of the Holy Quran’. I mention this, because, incidentally, I met three children with CP over the last two months to whom we donated wheelchairs; one was Vikas, the second Vinayak, and the third Messiah; (We have yet to purchase a wheelchair for Messiah, as his WC needs some special fixtures to hold his neck in place…. and it’s not yet available. ), and when I asked their mother’s what is the meaning of the names of their children, I learnt, Vinayak was named after Lord Siddhivinayak, and Messiah was named after Jesus Christ. I realized, God becomes our sole hope and strength when we are faced with an overwhelming lifelong adversity and challenge. Maybe by giving their special children such names, a parent must be hoping God’s benevolence, power, grace manifest in their special child. At least we hope it does. 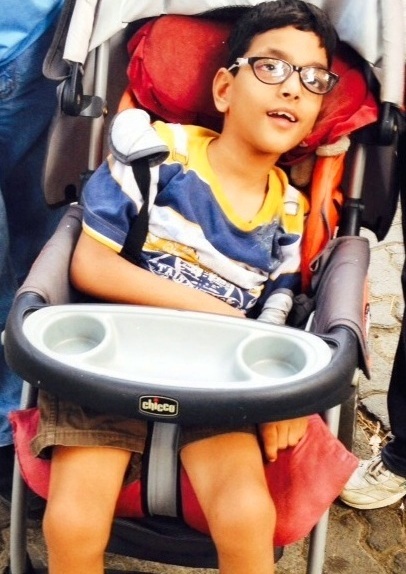 This, the wheelchair we donated to Yasin, will be his first. What is very very sad is, Yasin could walk since childhood, but only a few months ago he stopped walking. It happened when he was operated on his lower leg, at a hospital in Bandra, and for some reason, unknown to his family, Yasin cannot walk thereafter, post that surgery! From what I was told by Yasin’s mother, the Doctor who operated on him has no satisfactory answer as to why her son can now no longer walk post the surgery done by him! 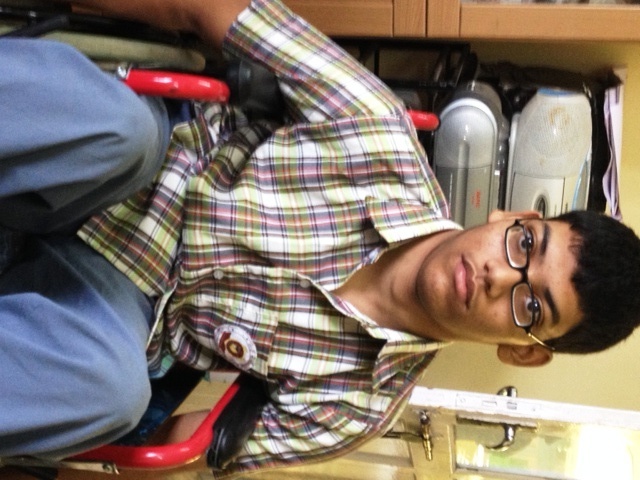 Yasin is studying Home Science at ADAPT, and likes to bake bread, pau, and sweet buns. Computers is his favorite subject, and he wants to do something in that field when he is ready to earn a living. He likes to go to Carter road and Band Stand to look at the sea. His mother takes him in an autorickshaw. He likes watching movies and his favorite recent film is ‘Jai Ho’, of Salman Khan. While Yasin was telling me things he likes and dislikes, his mother began to cry, in silence; discreetly wiping her tears with every sentence he spoke, even though Yasin was not sad speaking about his life. He was in fact often smiling while telling me about things he likes to do, even things that must be most challenging to him! “We can complain because rose bushes have thorns, or rejoice because thorn bushes have roses!” said Abraham Lincoln. It’s like, we rather think of our bicycle as a machine of ‘flight’, rather than a means of cardio or transportation. Yasin’s mother proudly told me, ‘Yasin keeps all the ‘rozas’ (fasting) during the month of Ramzaan.’ Wow! I thought. I asked Yasin, who is his most favorite teacher and student in school? His reply silenced me for a moment. I pondered. I could not immediately think of any of my more fortunate and more privileged friends who share such panoramic love for people they like. Even I myself have more-favorite and less-favorite pals, a kind of innocent hierarchy, amongst people I like and like to hang with! But here was a boy who in his prime youth has lost his ability to walk, has CP, has a speech problem, and so many other daily challenges, yet he shares a sweeping love for all! Yasin gained a brand new wheelchair from us, post our meet; and I, a brand new lesson. Thank you Yasin. Thank you to Vinay Datt, Pavitra Soans, and Surabhi Shah, (and an unknown donor from ADAPT), for jointly purchasing a wheelchair. And thanks to Himanshu Shah’s Health Care Equipments, Vile Parle east, for the good discount on the WC, and for delivering it to us. 69th recipient – All customers are good. All are equal. Like all Gods. 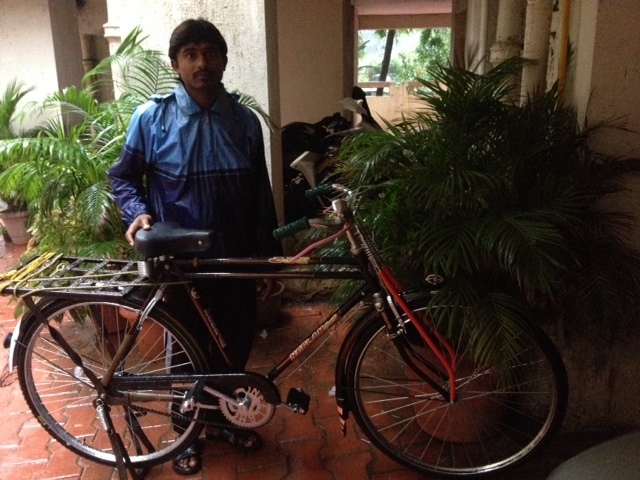 Anil approached me sometime last year, for a new bicycle in exchange of his old one. I had to refuse him, because his old bike’s frame was (broken) welded in two places, and we cannot possibly donate a broken-frame to anyone, however poor the needy. Anil’s bike was stolen a few days ago, I found that out from the man I buy fruits from; so I asked him to send Anil to me, provided he (Anil) was willing to bear half the cost of the new bicycle; Anil agreed to bear half the cost of the bike. Anil is from UP, he arrived in Mumbai three years ago, because his family needed money. They own some amount of agriculture land back in the village, but farming is not enough to sustain their family. Anil has two younger brothers and three sisters, one sister is married. His siblings go to school. He earns a monthly salary of 3500, and sends 2000 to his parents. 1500 is enough for him to sustain himself in Mumbai. He lives with his Boss, the man who owns the fruit business, and his meals are provided by his boss. Anil delivers fruit orders to their customers all over Bandra and Khar. Since his old bicycle was stolen, he delivers fruits on foot. The tips that few customers offer him when he delivers fruits to their doorsteps is the bonus he looks forward to but earns not so often. I find it strange, that we willingly tip Rs 50, 100, and some people tip 500 Rupees to the valet who parks our car at restaurants, cinema halls, 5 Star Hotels, but we may be often forgetting to tip the fellow who bicycles to us to deliver our fruit, veggies, house provisions, etc., orders. I asked him about his working hours. He replied, he works 6 days a week, from 6 am to around 1 pm and then from 4 pm to 10.30 pm. He gets Sundays off, and on that day he washes his clothes and cleans his house. He gets hardly an hour to 30 minutes to leisurely roam around on Sundays. It made me think of how most of my friends, or I, spend our Sundays. I spend Sundays riding with my friends or sometimes alone, and then the rest of the day I catch up with family or dear friends, or books, movies, theatre, or lost sleep. Blessed are we, indeed. I asked Anil about the happiest moment in his life so far? I asked him, who is his best customer, and why so? When Anil equated his customers being equal to God, (in the sense that for many their customers are like God to them, a ‘provider’ to them… and that all Gods are equal…), it made me think of the many people who preach about their religion, their Holy book, their God/s, their prophet, the heaven or hell they claim to have foreknowledge of, etc (and some of these people are self- proclaimed saints or Gods too :p ) ; I wondered how many of them would publicly agree with Anil, that their God, the path they point to, the road they have chosen, is equal to those taken by other travelers? I humbly believe, there is a ‘temple’ of God in each of us. Even in those who do not believe in Him, and in those who continue to seek proof of, or a reason for, His light, His energy, His existence. Thank you to ‘K’ for donating, for ‘providing’, a new bicycle to Anil; Anil shared almost half the cost of his new bicycle. And thank you to Kohinoor Cycles (http://kohinoorcyclestores.blogspot.com/) Siddharth Vora (https://www.facebook.com/siddharth.vora.58?fref=ts) for the good discount and service. And Thanks to Gazi Ali for the photo.